Sir Trevor Nunn’s emotionally resonant revival of Terrance Rattigan’s wartime drama FLARE PATH played the Theatre Royal Haymarket during the spring of 2011. It was part of the author’s centenary tribute. Written in 1941 and staged a year later,the play is based on his own experiences as a tail-gunner in the RAF coastal command. It is a love triangle,set in the lounge of a Lincolnshire hotel where bomber pilots,stationed at the nearby airbase stay with conjugal guests. Sienna Miller returned to the West End to play Patricia Graham, an actress torn between her pilot husband,Teddy (Harry Haddon-Paton) and Peter Kyle, (James Purefoy) her movie star lover. The production was a huge success and was extended due to popular demand. Critics called it “richly entertaining and beautifully judged revival of this theatrical rarity”…”a deeply moving portrayal of people at war”, said The Guardian’s Michael Billington. I managed to manoeuvre my way around the predatory packs of paps one April evening to ask Sienna to sign my sketch at the stage door. It was more a matter of ‘fright flare’ from all the flash bulbs going off! In fact, the illumination was so intense,she had to wait in between flashes to see the drawing which washed out under the brightness. James was a little easier. He and his dog emerged later to a much more sedate reception and happily signed. 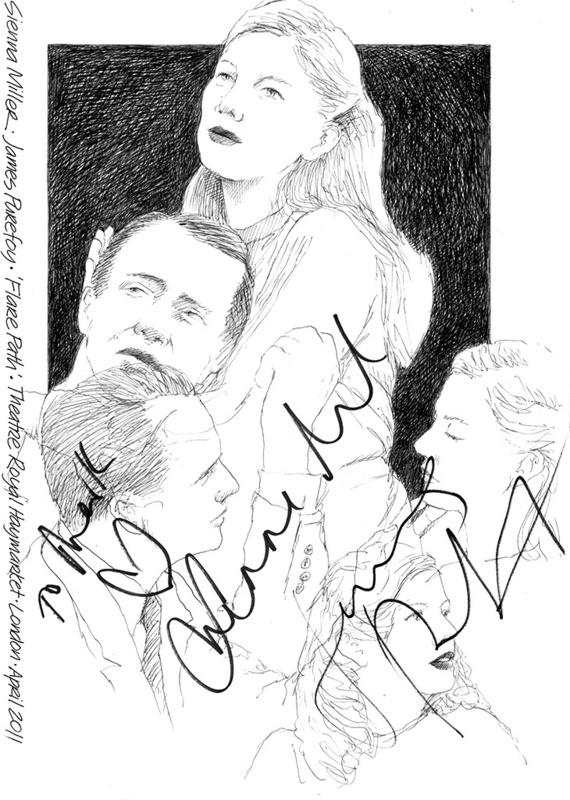 This entry was posted in Celebrity, Theatre and tagged Art, Autograph, Drawing, Flare Path, James Purefoy, Sienna Miller, Signature, sketch, Theatre, West End by Mark Winter / Chicane. Bookmark the permalink.